I'm late to the party, but I've caught up to the zeitgeist and discovered the musical Hamilton that was just awarded the Pulitzer prize in drama. And by discovered, I mean waking up to it on loop in my brain, watching all related Charlie Rose interviews and having my kids bop along in the car as I turn it down on those tricky PG-13 parts. 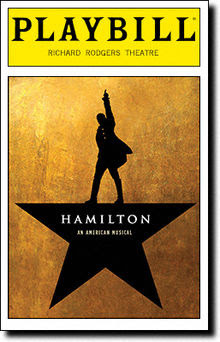 It's the story of the American Revolution, centered on the character of Alexander Hamilton, and never has a founding father seemed so real and relevant. It has all the big themes-- love, loyalty, legacy, jealousy, betrayal and forgiveness. It's told through the language of hip hop and I LOVE IT. It's not my lane of music typically, but it's weirdly perfect to re-imagine the founding of our country. If you are curious, dial up Amazon or Apple streaming music and listen to "My Shot", "Ten Duel Commandments" and "Who Lives, Who Dies, Who Tells Your Story" and I promise you'll want to listen to all 44 songs. And if you feel the need to deep dive into the story further (I did), here's a link with lots of related video clips. Secondly, the AMC series Turn (Mondays at 10 PM) began its third season last night. We've been invested in the series from the start. It is based on the book Washington's Spies: The Story of America's First Spy ring. What I like most about the series is that it shows there are people of integrity and of dishonor on both sides of the fight. I actually feel pretty ambivalent about main character, Abe Woodhall, because his personal life seems like a soap opera and he can't make his up about to whom he will be devoted. I admire the British leaders John Andre and Major Hewlett as they are honest in their dealings and respectful of women and servants under their command. I appreciate how it shows that there is good and bad on any two sides of a debate, and only winning casts one side as righteous. Okay, class, that's your viewing and listening assignment for the week. Let me know what you think!